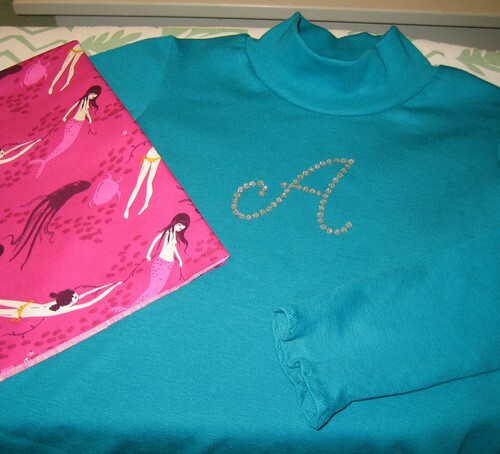 In an attempt to expand my (very limited) sewing horizons, I am working on a turtleneck for Anna for Christmas. The pattern is Jalie 2805 and, I have to say, it's pretty simple. Also nice is that one pattern makes both women's and girl's sizes, with a variety of necklines to choose from. (Full disclosure: I was originally going to sew a long-sleeve T for myself, but decided to try a smaller version first so as to waste less fabric if I screwed up.) The fabric is an interlock knit that I picked up locally at Bolt, my favorite shop for all things sewing. It does seem that finding interesting knits can be a bit challenging, so let me know if you've got a good source. The mermaid fabric I found online at The Fabric Farm. I bought a half yard of each of the two color options, but now I wish I'd bought more. There's only so much I can make with a half yard. I'm thinking another of the Oliver + S “Lazy Days” skirts (free pattern download here), but Anna has so many of those. Again, I'd love suggestions if you know of some cute (easy) kids patterns to try. I do think she's love the pink mermaid skirt with the teal turtleneck, though. That girl doesn't shy away from color! Oh, and the little "A" detail is just an iron-on patch I picked up at Fabric Deport. It's actually supposed to be more 3-dimensional, but apparently I'm iron-on challenged!